Evanescence has returned with their fourth studio album, Synthesis, which includes reworked versions of the band’s previous material with an orchestral arrangement and electronica music elements, in addition to two new songs, thus making it both a studio album and a compilation album. 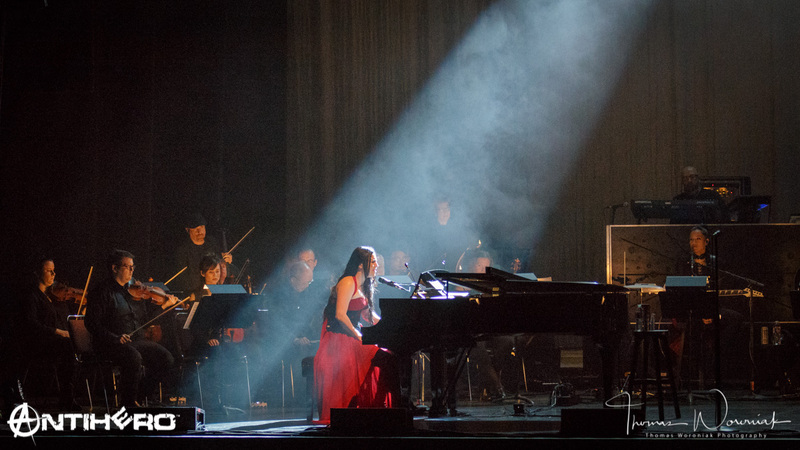 Like the album, “Synthesis Live” features a reimagining of some of Evanescence’s best-loved songs with the spotlight on full orchestra, electronics combined with the band and Amy Lee’s virtuoso piano and voice. On a Monday evening, the Kansas City Music Hall filled with fans eagerly anticipating the performance of Synthesis Live by Amy Lee and orchestra, which started with a series of orchestral pieces from Beethoven, Mozart, and even an arrangement of “Sally’s Song” from A Nightmare Before Christmas by Danny Elfman. After the thirty-minute orchestral warm-up, there was a brief intermission before the main act. Starting with the solemn introduction of “Overture”, Amy Lee takes her place at the piano and moves seamlessly into “Never Go Back”. The combination of the live orchestra with the traditional drum and guitar blends perfectly in this live concert setting. Lee’s voice is on-point and powerful, soaring through the arrangements by Canadian composer David Campbell, breathing vibrant life into the performance of Synthesis Live while creating an emotionally impactful atmosphere of longing and loss. Of course, audience favorites like “Bring Me To Life” and “My Immortal”, both from 2003’s Fallen, were met with enthusiastic cheers from the crowd. The entire Synthesis album is performed live, however not in the same running order as the studio album. You can see the setlist below.